Ahead of the Rio Olympics who are Team GB's best hopes for winning gold? Eighteen-year-old Amber Hill from Berkshire won the BBC's Young Sports Personality of the Year in 2013 and Rob Bonnet has been to meet her - and her grandad. Drastic action is needed to keep global temperate rises well below two degrees centigrade, according to panel of experts. Lord Adair Turner is chairman of the Energy Transitions Commission. A commemoration event will be held in Liverpool today to mark the outcome of the Hillsborough Inquests. Paul Greaney QC is a barrister who represented the Police Federation at the inquest. The Competition and Markets Authority is announcing new measures today after a complaint from Which? made last year alleging that supermarkets, through various tactics, were giving the false impression of savings. Speaking on the programme is Michael Grenfell, executive director for enforcement at the Competitions and Markets Authority. Ministers should abandon plans for new elected mayors, Conservatives have told this programme. Ross Hawkins is the BBC’s Political correspondent. Urgent government action is needed to stop up to 50,000 people a year dying early from air pollution-related illnesses, MPs say. Speaking on the programme is Dr Heather Walton, senior lecturer in Environmental Health at King's College London, and Neil Parish, chair of the House of Commons’ Environment, Food and Rural Affairs Committee. The names of all those who died in the Hillsborough disaster will be read out at a commemoration service outside St George's Hall in Liverpool later today. Alan Green was at Hillsborough in 1989 commentating for the BBC and he wants to see prosecutions. In the second of our leader interviews, ahead of May 5 elections, we speak to Nigel Farage, leader of UKIP. The names of all those who died in the Hillsborough disaster will be read out at a commemoration service outside St George's Hall in Liverpool later today. Yesterday, a jury concluded, by a majority, that the 96 Liverpool fans had been unlawfully killed. Speaking on the programme is Dr Dorothy Griffiths who lost her brother Vincent Fitzsimmons in the disaster, and Bishop Tom Williams, who was a parish priest at the time of the disaster and conducted some of the funerals. There are growing calls for senior police officers to be held accountable over the Hillsborough disaster in 1989. 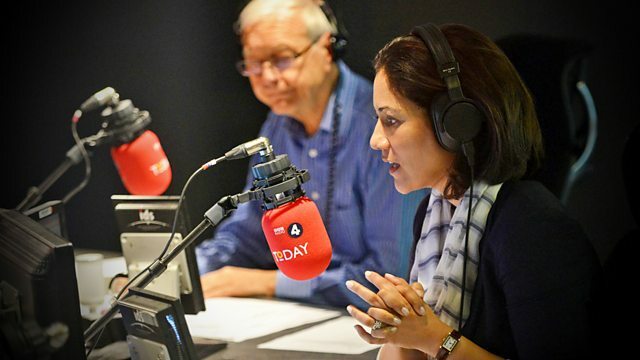 Speaking on the programme is Lord Macdonald, Labour Peer and former director of public prosecutions, and Clive Coleman, the BBC’s legal correspondent. Former Conservative Party chairman and former EU Commissioner Lord Patten says unless the Conservative Party re-unites after the EU referendum it will face very serious consequences. Speaking on the programme is Lord Patten. Choristers from the nation’s cathedral choirs will come together at St Paul’s cathedral in London tonight for a special concert. Speaking on the programme is Andrew Carwood, St Paul's director of music – he will conduct the choir tonight. Also on the programme are twelve of the choristers who will be performing Benedic Anima Mea Domino by George Malcolm. Next Thursday will see lots of different elections taking place across the UK. In Bristol, Labour are hoping to unseat the independent mayor who was elected four years ago. It is being seen as a key test for Jeremy Corbyn's leadership. The BBC’s Jon Kay reports. Relatives of the 96 football fans who died in Britain's worst sporting disaster say justice has finally been done, after an inquest concluded the victims were unlawfully killed. Speaking on the programme is Mick Ord, former editor of BBC Merseyside and Alastair Machray, editor of the Liverpool Echo.